1) 727 crates and boxes of material were packed in the old Museum space in the Darwin Building by specialist museum movers – Constantine. The reason for the move was two-fold: UCL recognised that we needed a bigger space to perform our role as one of the major gateways for the public to UCL, and a more accessible location to do it. Also, the department we shared the Darwin with needed more space to house people coming in from another building. The packing took three months, and the collection and the display cases were then stored off-site as we didn’t have access to the Rockefeller Building for a couple of months. 2) The day after the last crate left the Darwin a massive flood hit our two store-rooms, where the vast majority of our collections was housed. This was particularly bad timing as it was the same day that the Curator left the country to get married, and I returned from five months fieldwork in Australia. The whole UCL Museums department, and many others from across the University stopped what they were doing to evacuate the stores. It had taken over two months to diligently fill the brand new stores in January. It took a little over two hours to empty the soaked store where our “dry material” was kept. Fortunately we had the old Darwin space empty to use as a laying down space. For the period of the Museum’s move, it had been planned that we would have access to the stores throughout, we now had to pack all of the material to place in off-site storage (where it still is now) until after the move was finished. 3) While we were closed we still had to fulfill all of our university teaching with the collection. The first job was to rescue these specimens from the pile of flooded material, before they were sent off-site. The we could pack everything else. This meant that over the course of Summer 2010 all 68,000 specimens in our care were packed and moved, most of them for the second time in a year. 4) With the stores drying out and the collection safely housed elsewhere, we could return to rebuilding our Museum in the wonderful Edwardian former Medical Library in the Rockefeller Building. This room is lined with well over 100 book cases that we were to fill with specimens. In addition, a large structure was built to house our cases we brought from the Darwin, including those from the 1851 Great Exhibition at Crystal Palace. 5) Unpacking the Museum in the Rockefeller took about three months. Although our main vertebrate cases remained largely the same, all 131 other cases were to be designed from scratch. Normally a museum would do this before a move started, but as we didn’t have time before we left Darwin, and the cases in the Rockefeller are each a different height, width and depth, we decided to make it up as we went along. 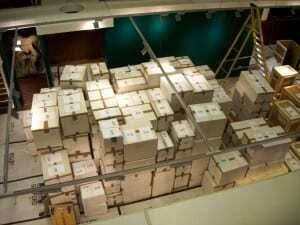 6) Filling the cases went like this: Choose a crate and unpack it. Cross the crate off the list. Measure the specimen. Find a case it would fit in. Document where you put it. Repeat. Towards the end I went round and made things make sense thematically, at least on the bottom row where people can get up close. 7) Bring in the technology. We have always been an “old fashioned museum”. By that I mean that on a daily basis people come in and say “this is what a museum should look like”. We have A LOT of specimens on display and people like that. However, we are also one of the biggest contributors to adult science engagement in London and are not old fashioned in our practice. Working with geniuses at the UCL Centre for Advanced Spatial Analysis and UCL Centre for Digital Humanities, we now have in place some wonderful interactives that don’t detract from specimen-engagement in the way that computers and animatronics have in some museums. The QRator project uses CASA’s Tales of Things technology on a specially developed app on ten iPads attached to displays across the Museum. We are using these iPads to ask our visitors to comment on the role of science in society and museum practice today. For the latter at least we will use what they say to inform how we do things. See here for a timelapse video about the iPads being installed. Each iPad will have a question, and visitors can respond on the iPad itself, or via twitter or Tales of Things on their smart phones. From next week each question will also have it’s own website so people can get involved from their home computers too. Watch this space. 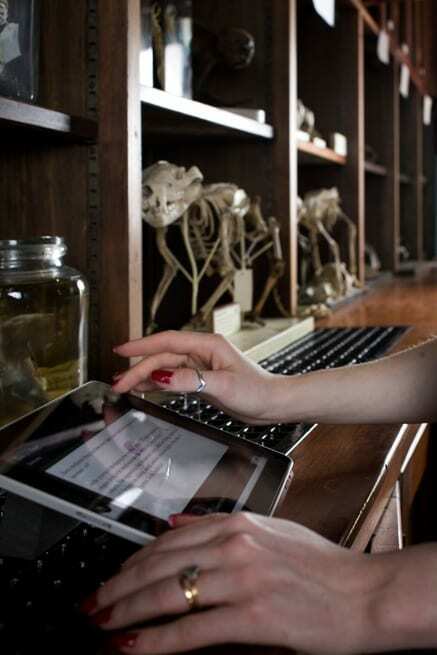 In this way, we are using a fantastic and accessible historic collection alongside cutting-edge technology in a way that Museums have never done before. 8 )Our next major project is to provide expertise and a venue to work with UCL researchers – both scientists and artists – to engage the public in their current research. Three areas of the Museum are dedicated to such temporary displays, and we are looking with UCL folk to work with to build exhibitions in – let us know if you have any ideas. The Museum is now open every week day from 1-5pm, plus there is a wide range of great public events every couple of weeks.